Just as with other parts of the face, the lips also change their shape, as we get older. These changes are frequently noticeable in women, as the lips lose their fullness and "Cupid's Bow" shape and become flatter and thinner. Lip Augmentation Surgery at Dr. Slupchynskyj’s New York practice is unique. Unlike other Lip Augmentation procedures, which use temporary injectable fillers to create volume, Lip Augmentation Surgery is a permanent alternative, which enhances the patient’s own lips. 35 year old female complained of a naturally thin upper lip. She wanted fullness, a more pronounced cupids bow but did not want a temporary result. Dr. Slupchynskyj performed the Gull Wing Lip Lift, resulting in a naturally fuller appearance without being overdone. 60 year old female unhappy with thinning upper and lower lips. Dr. Slupchynskyj performed Lip Lift Surgery, which resulted in a naturally lifted and fuller lip line without the use of implants or fillers. After photo shows patient one month post surgery where she also underwent the SLUPlift™ mini lift, Endoscopic Brow lift and Blepharoplasty (Eyelid Lift). 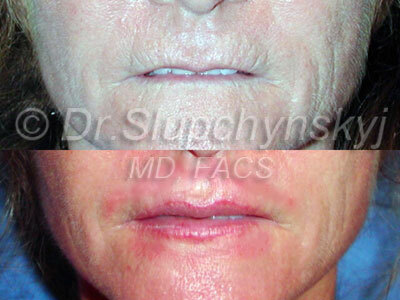 59 year old female who traveled from Bermuda for Lip Enhancement Surgery with Dr. Slupchynskyj. This patient complained of extremely thin upper and lower lips as well as extensive vertical lip lines, often referred to as “smoker’s lines”. 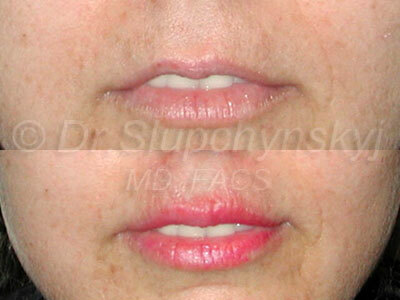 Dr. Slupchynskyj eradicated her lip wrinkling with a dermabrasion treatment. 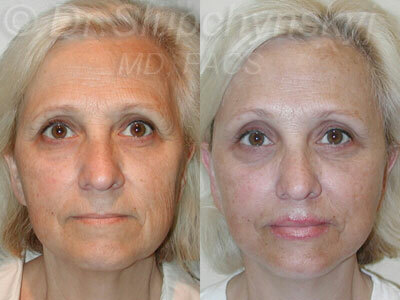 This patient is 3 weeks post-operative and very happy with her results. The corners of the mouth also lower as the skin and muscle lose their tone. While some patients opt for the use of filling agents, such as Juvéderm®™, others often consider undergoing a surgical procedure to lift the upper lip and restore its previous contours. What is Lip Enhancement Surgery? Dr. Slupchynskyj may supplement the final result using fillers such as Juvéderm®; however, the most visible and attractive results are a result of his innovative surgical techniques. Dr. Slupchynskyj realizes that bigger isn’t always better when a patient opts for Lip Augmentation. He takes time to assess the patient’s other facial features before performing Lip Augmentation Surgery so that he can create an outcome that delivers a balanced, youthful look. Many patients are familiar with the use of injectable fillers to give the lips a fuller and more well rounded appearance. However, Dr. Slupchynskyj reminds that “bigger is not always better”. Lip Enhancement Surgery, however, does offer certain advantages over the use of filling agents. As we get older, lips can get longer, turn down at the corners, get thinner and the area around the mouth gets loose. An old mouth can make a face look less youthful than it should even after a Facelift. Dr. Slupchynskyj believes if you don’t address the mouth, you can’t have a youthful face. Lip Enhancement Surgery no only restores a more youthful appearance to the mouth area, but the procedure can also function as part of the overall improvement for the face. It’s about achieving total overall aesthetic harmony not only in the entire mouth area but als0 in the rest of the face. If you look at pictures of young models in, you’ll notice that they have a short upper lip and a pouty, turned-up mouth. Those characteristics are not achieved by simply increasing the size of the lip with injections. The structure of the lips includes the primary muscle groups under the skin, as well as eight muscles that connect at the corners of the lips (also called the “oral commissures”) to control facial expressions. Since the skin under the lips has nearly no fat, the surgeon may choose to supplement Lip Augmentation with fillers. Dr. Slupchynskyj also considers how the underlying dental work and jawline gives shape to the lips. The contours of the upper lip on a younger patient resemble two elongated “M’s” stacked atop one another, with a stretched “W” at the base of the lower lip, forming the classic “Cupid’s Bow” shape. The “bumps” in each “M” in the upper lip correspond to the corners of the depression that forms between the base of the nose and the top of the upper lip (known as the “philtrum”). As the patient ages, these “letters” become flatter and the lips become thinner. The oral commissures tend to sag, which pulls the lips down and makes the patient appear to be frowning. The Lip Enhancement procedure works by moving the vermilion border (the line between the upper lip and the philtrum) up as much as three to five millimeters. The lifting process gives the upper lip a fuller appearance and pulls the oral commissures up to reduce “frown lines”. A popular Lip Lift technique is the vermilion lift, or “Gull Wing”, procedure. The Gull Wing Lift gets its name from the contour of the upper lip, as its “M” shape resembles the wings of a seagull. The technique is highly effective at enhancing the colored area of the lips. Another effective procedure is the subnasal (or “Bull Horn”) technique. In the Gull Wing procedure, the incision is made along the upper lip during Lip Augmentation; as the name suggests, the incision is under the base of the nose in the “Bull Horn” operation. This incision follows the curve of the nose (which resembles the horns of a bull). A thin layer of skin is removed from under the nose, and the remaining skin is then pulled up to meet the incision. Almost every form of surgery, cosmetic or otherwise, carries the risks of scarring so it is critical to select a highly qualified Facial Plastic Surgeon in order to reduce your risk of scarring in any area of the face being treated. Dr. Slupchynskyj always limits both the extent and the visibility of any incision made. Each Lip Augmentation Surgery technique has its own unique approach to minimizing the appearance of scars. In nearly all instances of any minor post-surgery scarring, the incision lines fade within a few weeks. With incisions and movements measured in millimeters, the need for precision in the Lip Enhancement procedure is vital which a Facial Plastic Surgeon can perform. Some surgeons cannot always insure a symmetrical appearance to the lips after the Lip Lift. Due to variations among patients, one side of the lip may appear a bit fuller than the other. Post-surgery swelling can also lead to a temporary asymmetrical appearance, but the swelling typically resolves within 5 to 10 days. Some patients may experiences a tight feeling around the lips after their Lip Lift. Some of this sensation may be attributable to normal post-surgery swelling, which resolves quickly. Other patients may report tingling in the lips for a few hours after the Lip Enhancement procedure. The feeling of your lips without any tingling should return to normal within a day or two. Before the Lip Augmentation Surgery, Dr. Slupchynskyj will consult with the patient on the current state of his/her lip structure, the options for the Lip Enhancement Surgery, and the anticipated results. He will also recommend that the patient stop smoking for at least two weeks before the procedure and after. The patient should also avoid medications and dietary supplements that act as blood thinners such as Aspirin and Vitamin E. These items can cause additional bleeding during the Lip Lift Surgery and can prolong recovery times. Patients with oral herpes (HSV-1) or cold sores should take an antiviral medication such as Valacyclovir (Valtrex) before the procedure. If the patient has a cold sore, Dr. Slupchynskyj may also recommend applying Acyclovir (Zovirax) cream to clear up the outbreak. The average recovery time for Lip Lift Surgery ranges from seven to 10 days. Any swelling usually dissipates within a week. Dr. Slupchynskyj advises the use cold compresses and herbal remedies (Arnica Montana and Bromelain) to speed up the healing process. The Lip Augmentation procedure can often achieve results for patients that are both more remarkable and last longer than those available with injectable fillers. The Lip Enhancement operation is also often combined with other cosmetic procedures to produce a more consistent (and younger) appearance for the entire face. Although the outpatient procedure lasts less than an hour, Lip Lift Surgery can take off up to ten years from a patient’s face. In such a short time, Dr. Slupchynskyj can improve a patient’s look from thin-lipped and frowning to full-lipped and energetic. Contact us today to find out how safe a Lip Augmentation is, with little or no scarring and a quick recovery!